Hello sweet friends! 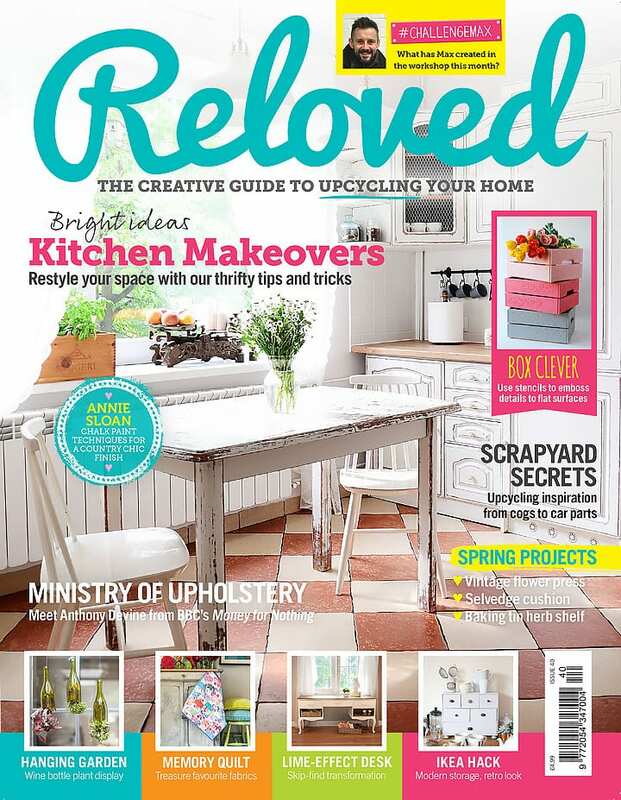 Have you tried gilding wax on any of your makeovers yet? 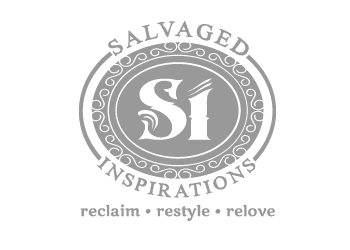 If not, I hope today’s post inspires you to give it a go! I’ve been applying metallic accents to a lot of my work and I’m loving the effect. 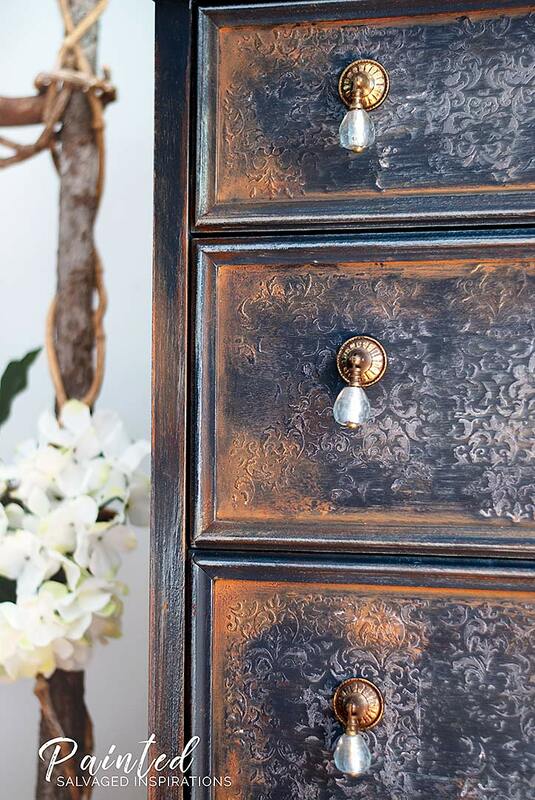 The best part, depending on how the gilding wax is applied, it can add subtle elegance, an old-world flair, or as in the case of today’s thrift store makeover, a bold dramatic punch. 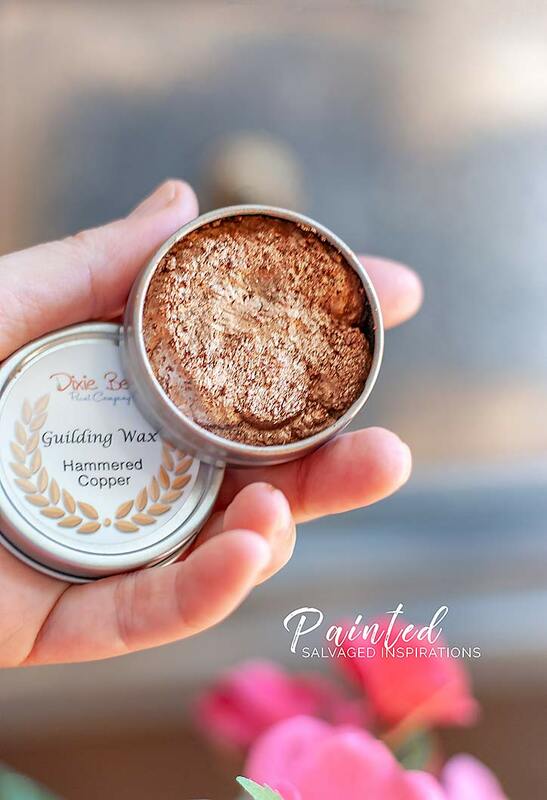 Today, I’m sharing a few of my how-to tips and techniques I’ve been using to create different looks with gilding wax. Here’s what I started with. A plain but good quality thrift store find I picked up on sale for $30. Can’t get better than that, right?! For the base, I used a brand new Dixie Belle color called “In The Navy”. If you’re looking for a gorgeous rich TRUE navy blue, this is it! It’s highly pigmented and has amazing coverage. Here’s the coverage after just one coat and I even used water to thin it down a little. 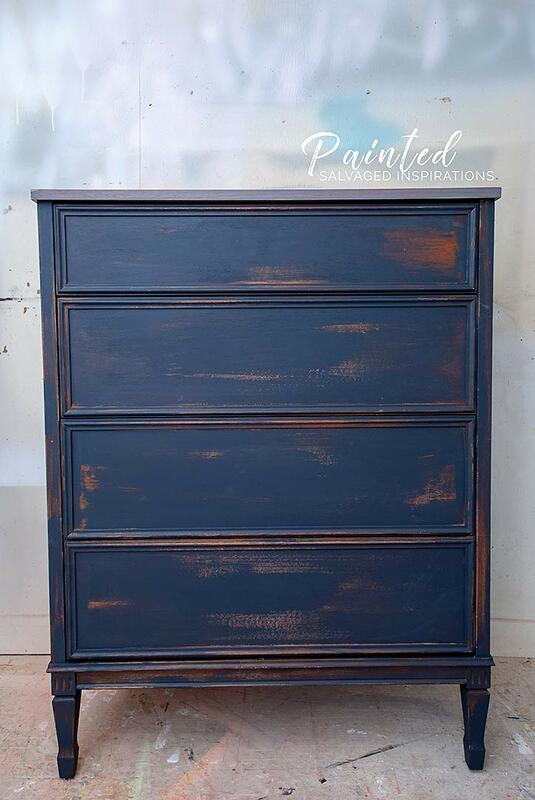 After the base coat, I mixed some spackling with a small amount of Savannah Mist and applied a raised stencil design onto the drawer fronts. I can’t tell you how many times I’ve used this stencil. It’s small, but one of my favorites! I’ll link some of the other furniture makeovers I’ve used it on in the “Related Posts” below so you can check out how it looks in different styles and colors. I’ve applied gilding wax with my fingers, a shop towel, Q-Tip, soft rag, and paintbrush. I have a few designated paint brushes I use for metallics because the bristles will stain as you can see below. I also apply the Gilding Wax AFTER I’ve painted and top coated the furniture with clear or dark wax. You could wait until the wax is fully dry if you prefer but I don’t think it makes much of a difference. I’m not sure if you can use gilding wax over a poly topcoat. If anyone has tried or knows the answer to this, I’d love to know too! There’s no need to seal the gilding wax. I find it dries really well and hasn’t rubbed off any of my pieces. If you find it fades over the years, it can easily be touched up by applying a little more. Tip #3:: Works on Almost Anything! Gilding Wax can be used on almost anything! I’ve seen it used it on pumpkins, resin, all sorts of craft projects, plastic, paper, metal, and wood. My sister has used it for scrapbooking and cards (her handcrafted cards are phenomenal btw – a real work of art!) and of course my favorite – FURNITURE! It’s typically used for highlighting details on furniture like moldings, appliques, castings, engravings etc. but can be used equally well to create some drama. Mix and match different gilding waxes. 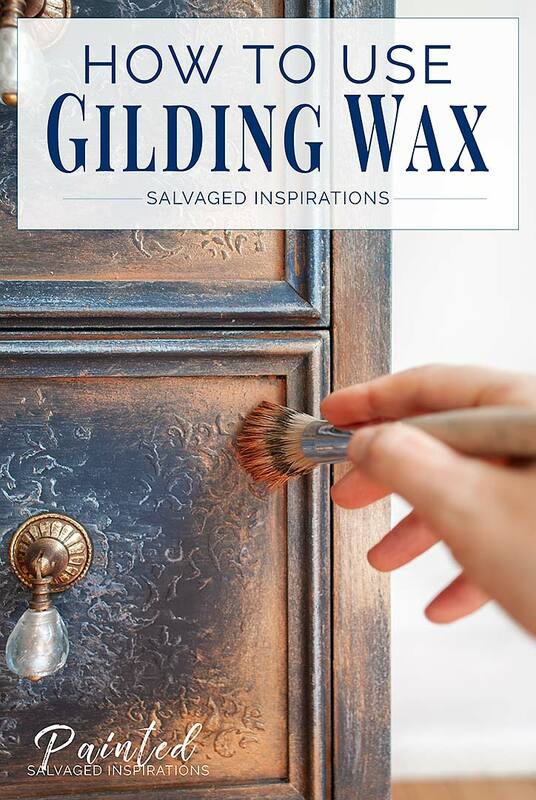 I haven’t tried mixing gilding waxes yet, but you can get really creative using different colors and metallics to create your own unique masterpiece. 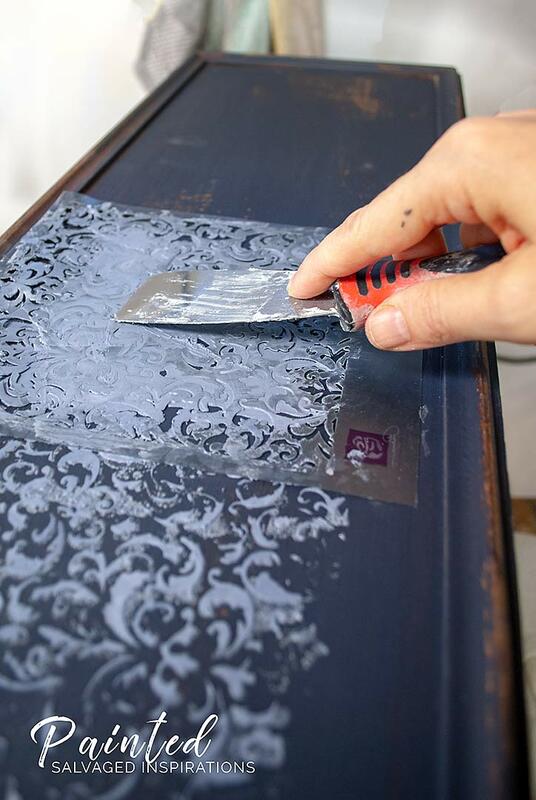 Create pristine metallic lines on drawers. If you’d like to create metallic pristine straight lines, no problem. Just mask off the section with painters tape and apply the gilding wax to the exposed area only. Remove the tape and voila! If you don’t like the look, no problem. Supposedly gilding wax is forgiving and can be easily removed with clear wax. I say “supposedly” because I’ve never tried removing it. Lucky for me I have always liked the look. That said, if any of you have a tip on how to successfully remove gilding wax, I’d love to hear about it. 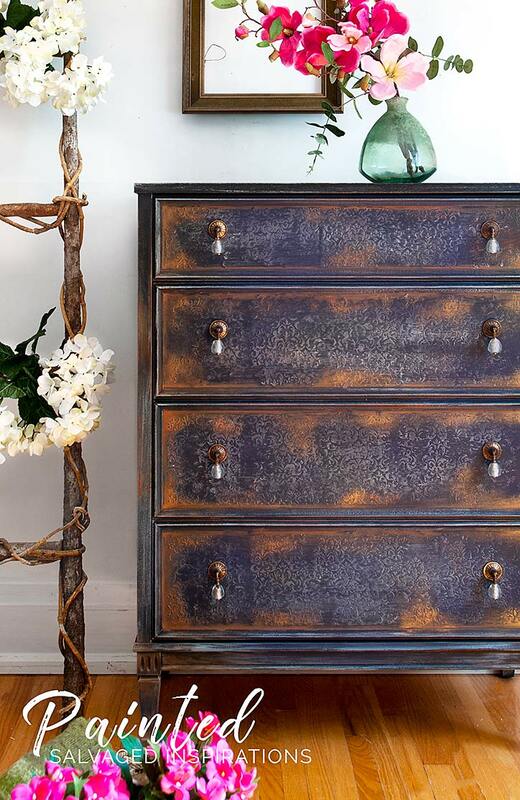 To create a bold dramatic look, try using a matching paint color UNDER the gilding wax. 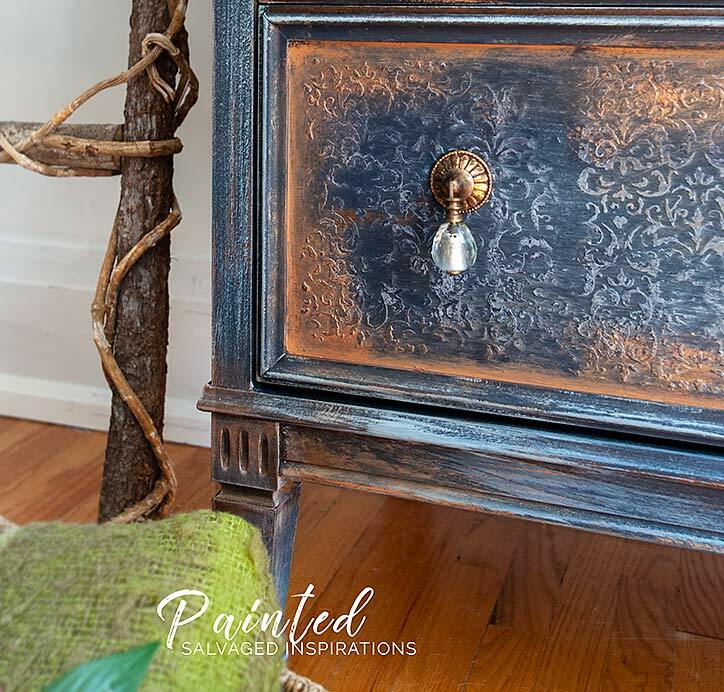 For instance, on this dresser, I applied some Terracotta around the edges of the drawers to amplify the effect of the Hammered Copper Gilding Wax. The orange/copper undertones of the Terracotta intensifies the metallic copper… it worked beautifully. 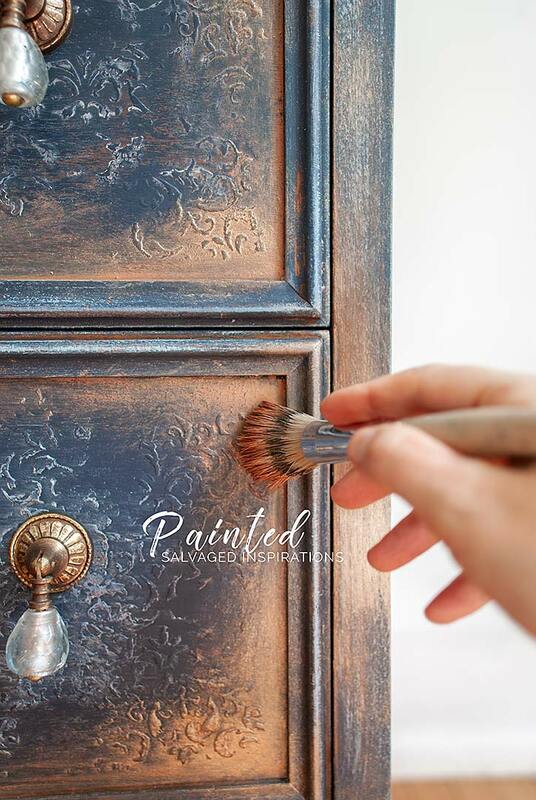 If you want to add a little dramatic glitz, subtle elegance or old-world flair, I hope this has given you a few ideas for your painted furniture or project. Happy furniture painting and gilding my friends! Hi Denise, I have a similar piece of furniture and would like to try the same technique. This is my first time using Dixie Belle products, What size navy blue do you recommend for a piece this size? Thanks! Excited to try this. Hi Denise I was just reading your comments on how to remove wax, I wonder if heat would help as wax melts at low temperatures. Maybe a hairdryer and thick tissue or even a craft hot gun held at a distance from the piece. I haven’t tried it myself yet. Many times when I have spilt wax from candles on my table I cover it wilth kitchen roll (thick tissue) and get the iron on medium and just hold it on the area for a few seconds, the wax then melts and soaks into the tissue BUT be carefull not to hold it for too long and always clean your iron once it’s cooled. Just a thought. The problem would be in the deep grooves I guess. kind regards Sheila C. Cochrane. Another amazing piece to inspire me! I love that you used so many different techniques to achieve this stunning look, yet it all works so well. As someone above commented, it certainly is not a $30 salvaged piece of furniture. 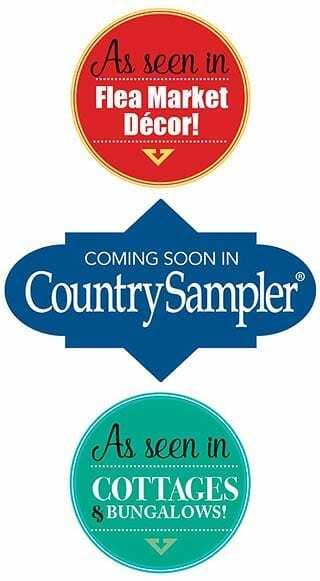 My question is, how does Dixie Belle Guilding Wax compare to Rub ‘n Buff? I’ve always use the Rub ”n Buff and I like it, except the tubes get all crinkled and sometimes I put holes in them?!? Also, is it available in many colors? I’m all about the bling! Love your work and bookmark just about everything!! Hi. I’m not sure where the Teriracotta and Savanna Mist come into play Could you tell me how ? That is just gorgeous! I am in process of remodeling a navy and copper kitchen, and might try this for the vintage storage piece in the kitchen. Can I aks where you got the glass knobs on the dresser? They are exactly what I was looking for! Thank you Karen! 🙂 The glass knobs are from Hobby Lobby. up coming project and wanted to use a Poly Top Coat as a finish…??? Maybe gilding wax on top of the poly topcoat? 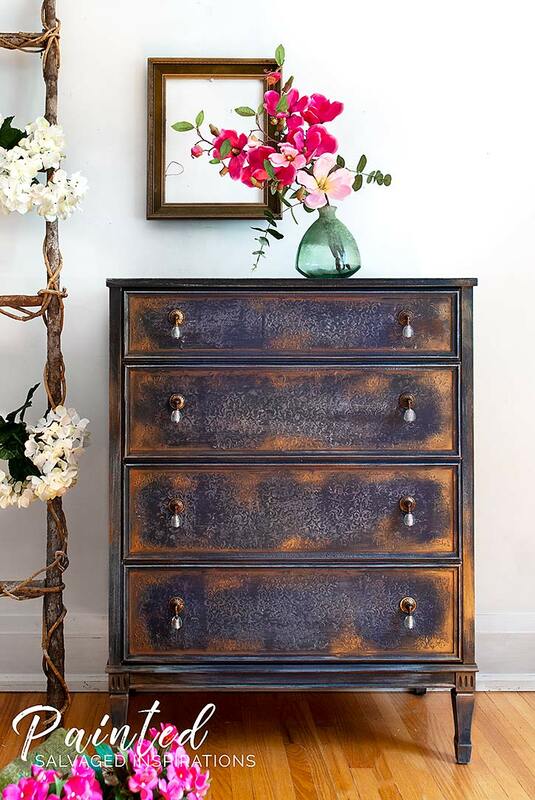 I have retired from selling furniture for profit but I love this dresser so much (sigh) that it might just be inspiration for a piece to call my own. I’m a pushover for dark blue and the gilding wax adds some pizazz. And I’ve been wanting to try doing a raised stencil. 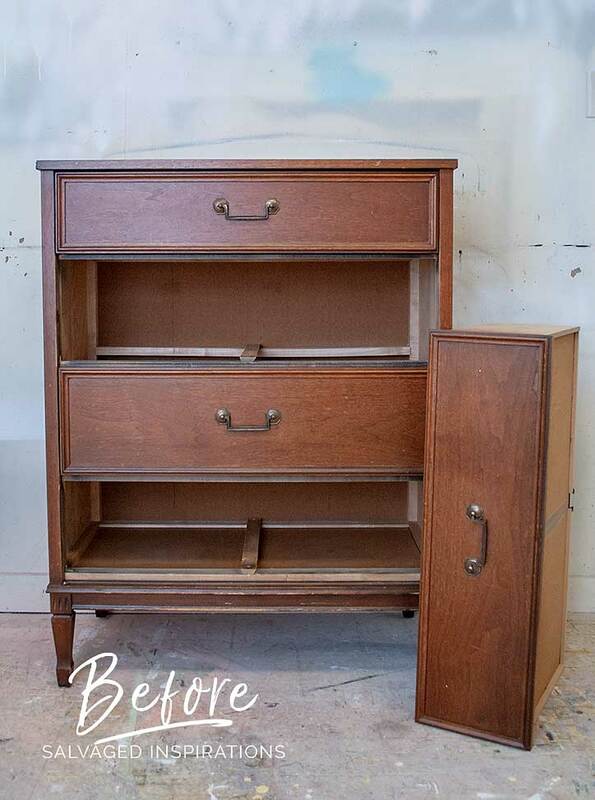 I think I’ve talked myself into redoing the old bare bones dresser in my bedroom! Hi, I love the look. Could you tell me what spackling is? I’m from U.K. so it’s probably called something else over here! Just Stunning !!! 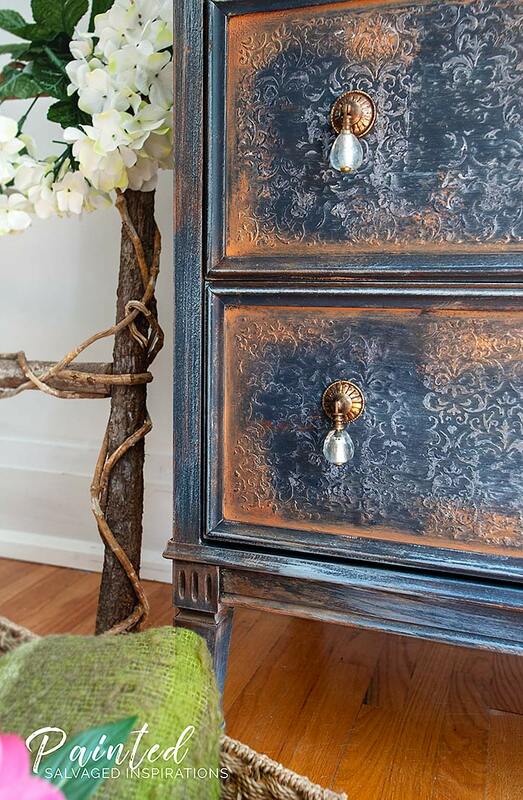 Luv everything about this Bureau !!!! You are amazing! I love your work and am so inspired by you! Your blogs are awesome too! Hi Cindy!!! 🙂 I love this. It’s amazing how good quality furniture can be passed down and still be functional (with stickers and all…lol) after years of use. If/when you decide to give it a new look, raised stencils are fun and they don’t have to be perfect to give a really nice effect. First of all, that dresser turned out gorgeous! Second, funny, I have that same stencil. I’ve also had it for ages and strangely enough I never realized it was a Prima Marketing stencil until this past weekend when I noticed the tiny little logo in the corner. 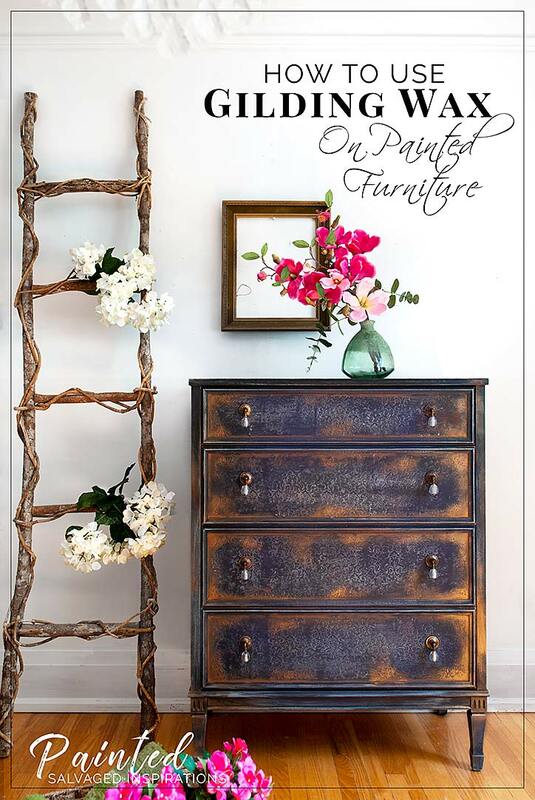 Now I might have to try using it to add some texture because I love how it looks on your dresser! Ahhhaaa, you’re going to LOVE it Christina! You can get so creative and even if you just use a little for highlighting, its amazing stuff. And as for the spelling of gilding/guilding… I was just as confused…lol. I think it can be spelled both ways but my spell check kept wanting to replace without the “u” so I just went with it…lol. That’s a really nice different look. Love how the stencil work takes on a haphazard look. 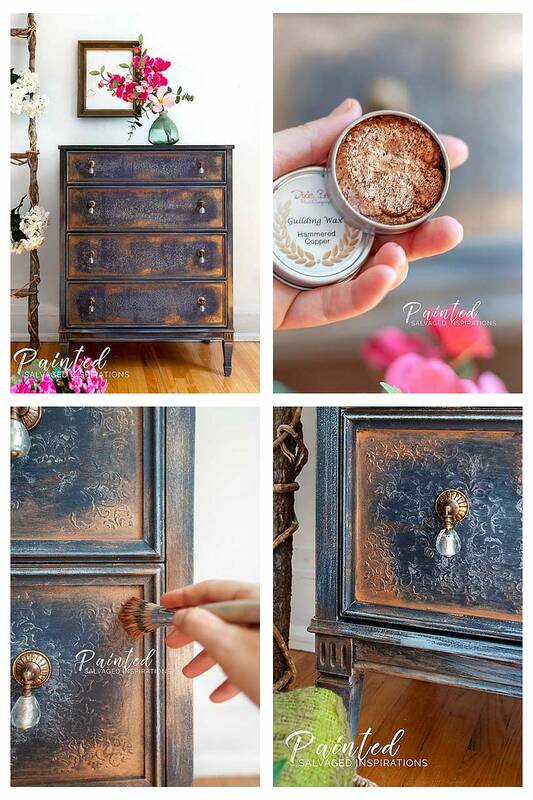 I’ve used Rub-N-Buff over poly, so maybe gilding wax would work too.. LOL 126 furniture makeovers! …someone was reading…lol. 😉 You’re the best Tracy. Hugs. 🙂 And very interesting. Maybe I should try adding a little to the top that was sealed with poly and see how it works. If you’ve had success with Rub’N Buff I’m guessing it just might. Thank YOU!